Diana Rigg in Doctor Who: The Crimson Horror recap. A Victorian mystery in the North … with Diana Rigg. 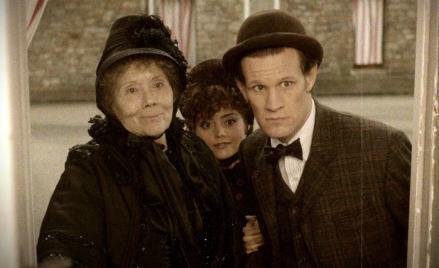 Diana Rigg, Jenna-Louise Coleman, and Matt Smith in Doctor Who. In Slate’s Doctor Who TV Club, Mac Rogers discusses the Doctor’s travels via IM every week with the show’s bloggers and fans. This week he’s chatting about “The Crimson Horror” with Slate culture critic June Thomas. Mac Rogers: It’s 1893, and Vastra, Jenny, and Strax are investigating the mystery of a dead man who has a waxy red substance covering his body … and the Doctor’s image in his eyes. The trail leads the three to Yorkshire and the Victorian-era compound Sweetville, run by Diana Rigg’s Mrs. Gillyflower. June Thomas: First, let me express my relief. If not an absolute know-nothing, I’m at best a Doctor Who know-little. So imagine my delight when I realized that this was Mark Gatiss’ attempt to write a self-consciously Northern episode. It was apparently tailor-made for Dame Diana Rigg and her daughter, Rachael Stirling, who had never acted together before. I didn’t know until I looked it up that Rigg is a Yorkshirewoman, born in grim Doncaster. Gatiss is also a Northerner, of course. From Sedgefield, better known these days as Tony Blair’s former constituency. June: As a daughter of the North myself (albeit from the other side of the Pennines), I was fascinated by the way Gatiss touched on some Northern clichés. I’m only exaggerating slightly when I say “The Crimson Horror” was an exploration of Britain’s North-South divide with a guest appearance by Doctor Who. Mac: Strax saying “We are going … to the North” seemed like one of those lines that would get big laughs in the U.K. and puzzlement from BBC America viewers. June: Right! The episode fit right in to the British cliche of “It’s rough up North.” And it is, generally speaking. The South is more affluent, the North gets less resources, but one problem is that the image of the North is still a bit stuck in the Victorian era. Phrases like “There’s trouble at t’Mill” are throwaway references to the days of the Industrial Revolution, when the North became the engine of social change. It was no coincidence that Mrs. Gillyflower led her congregation in a chorus of “Jerusalem,” based on William Blake’s poem. Jerusalem’s “dark satanic mills” are very present in Sweetville. Mac: That is fantastic stuff. I had no idea Gatiss was playing such a layered game with this episode. Mac: Ah, so “There’s trouble at t’Mill. She’s a lizard” is basically Monty Python-meets-Doctor Who. Speaking of the congregation, I was startled by the episode’s repeated willingness to attack religion in all but name. The Doctor calls Ada’s beliefs “backwards,” and he disparages end-times sermonizing. It’s striking that one of Mrs. Gillyflower’s chief instruments of propaganda, the organ, swivels around at the climax to become the controls for the poison rocket. June: I wish that some alternative had been posited. All those eager young people standing in line for Sweetville’s bright shining future were looking for a New Jerusalem, and even though the canal-polluting eugenic future envisioned by Mrs. Gillyflower and Mr. Sweet wasn’t it, nobody else, including the Doctor or Vastra, had anything else to offer. Mac: How great is it to see Rigg back in action? I’ve seen her a bit on Game of Thrones, but otherwise she’s been out of the game since 2006’s The Painted Veil. She seems to revel in playing this hammy villain. If there were a price of admission for “The Crimson Horror,” her delivery of “Now, Mr. Sweet! Now the whole world will taste your lethal kiss!” would have been worth it. Mac: In the hands of an actor who showed even the slightest embarrassment playing that moment, it would have bombed, but she went all out. Rigg got all the ham, but Stirling got all the pathos as the long-suffering Ada, blinded by her mother’s experimentation. The “monster” reveal of her imprisonment of the Doctor was clever. I kept yelling at Jenny, “No, come on, don’t let it out!” Red Doctor’s definitely gonna give some kids nightmares! But Ada’s attachment to him was the strongest emotional element of the episode. June: I wish the Doctor could make someone like Ada his companion. She’s good and loving, and like some earlier companions—I’m thinking especially of Donna Noble—traveling with him would help her realize her true potential. Mac: You know, I don’t think there’s ever been a companion with a disability—blindness, deafness, paraplegia, anything like that. I’d love to see that explored. I did have a moment at the end of “Crimson Horror” thinking: Huh, so the TARDIS is the same as Mrs. Gillyflower’s utopia to Ada—no room for her. June: Yes, he’s forever saying it’s bigger than it looks, and yet he can’t find space for one more? As an occasional Doctor Who watcher, rather than an obsessive, I was surprised by how much time was spent on the final Clara coda. Mac: It seemed like they were setting up two things there: Clara seeing her first definitive evidence of one of her other selves, and the idea of the kids she’s looking after, Angie and Artie, traveling on the TARDIS. Strange to bring the companion’s family along for a trip. Wonder if that’s a hint about the resolution of the Clara mystery? June: I know her mysterious origin story is a massive theme this season, but that scene felt excessive. Mac: I felt like Gatiss went the extra mile in making the dialogue florid and of its time. I loved lines like Mrs. Gillyflower saying to Ada, “Do not claw and slobber at my crinoline,” or Ada lashing back at her later with “You perfidious hag! You virago! You harpy!” Did you enjoy the dialogue or was it a bit much? June: I LOVED it. And it makes total sense. If you’re going to have two great classical actresses on a show like Doctor Who, you have to write something commensurate with their skills. Gatiss had apparently worked with both of them, so he knew their strengths and wrote to them. Mac: The Doctor and Clara don’t show up for a surprisingly long time, and then Jenny, Vastra, and Strax do most of the day-saving. There have been a lot of calls for these three to have a spinoff since 2011’s “A Good Man Goes To War.” Any chance this was a backdoor pilot for such a spinoff? And if so, would you watch that show? June: Would I watch a show about a Sapphic Silurian and her human wife?! Uh, does the Eleventh Doctor like bow ties? June: Strax reminds me of Magersfontein Lugg, Albert Campion’s manservant, especially as played by Brian Glover in the TV series Campion, where the eponymous detective was played by none other than Fifth Doctor Peter Davison. And, coincidentally, Brian Glover’s Lugg was very, very Northern. Mac: It’s all coming together! This actually brings up my least favorite moment of “The Crimson Horror”: the Doctor kissing Jenny after she rescues him. Kinda icked me out. It’s out of character for this Doctor to initiate a kiss, and it’s particularly weird for him to force a kiss on a woman who he knows doesn’t prefer 1) men or 2) mammals. June: I’m so glad you said that! It reminded me of Gibbs kissing Abby in NCIS, which also squicks me out. Though Abby minds less. Correction, May 5: June Thomas originally claimed that the Monty Python team was composed of “posh Southern boys.” In fact, only John Cleese was born in the South of England.